This guide contains all of the steps necessary to convert a normal setup to a masterkey setup. Before: www.chronoscan.org/ChronoScanFiles/Demo_Jobs/ChronoScan.Masterkey_Conversion_Guide_BEFORE.zip - Start on step 2. A very important step, on any configuration for that matter, not only masterkey configurations, is to take advantage of any database data that can be used. Here we are going to import vendor data from a master vendor database not only to convert an existing Job to use masterkeys but also to enhance our application. The first step is to create a connection to the master vendor database. 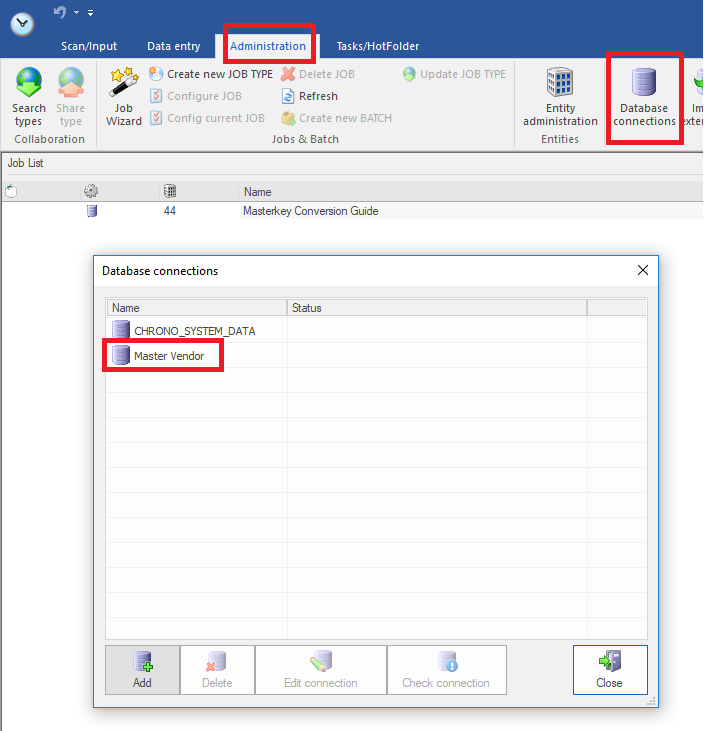 On the Administration Tab create a new database connection to your master vendor database on the Databases Connections menu. We will be using a connection called Master Vendor for this guide. Now it is time to import the vendor data to ChronoScan's internal database so it can be used. Still on the Administration Tab we are going to use the External Data Import tool to do that. The data source should be the vendor table on your master vendor database. The target table should be the chrono_Suppliers table on ChronoScan's database. This can be customised but we do recommend sticking to the chrono_Suppliers table. To see the source and target fields click on View Fields button. It is very important to only use fields that contain data that is displayed on the documents, there is no need to import all the data. Usually importing the name, any tax ID or code, web addresses, emails and phone numbers is more than enough. At least one LookupKey link must exist. This is usually set to the vendor ID column on the source database and should always be set to Company ID as the target field when using the chrono_Suppliers table. When ready, click on the Execute Import button. Still on the Administration Tab we are now going to use the Intelli-tag Import function to generate Intelli-Tags that will identify the masterkeys, or vendors, on our documents using the data we just imported. When following this guide to the letter the existing import configurations should be all you need. Because we only imported into Company ID, PhoneNumber, FaxNumber, website and email1, those will be the configurations we will run. 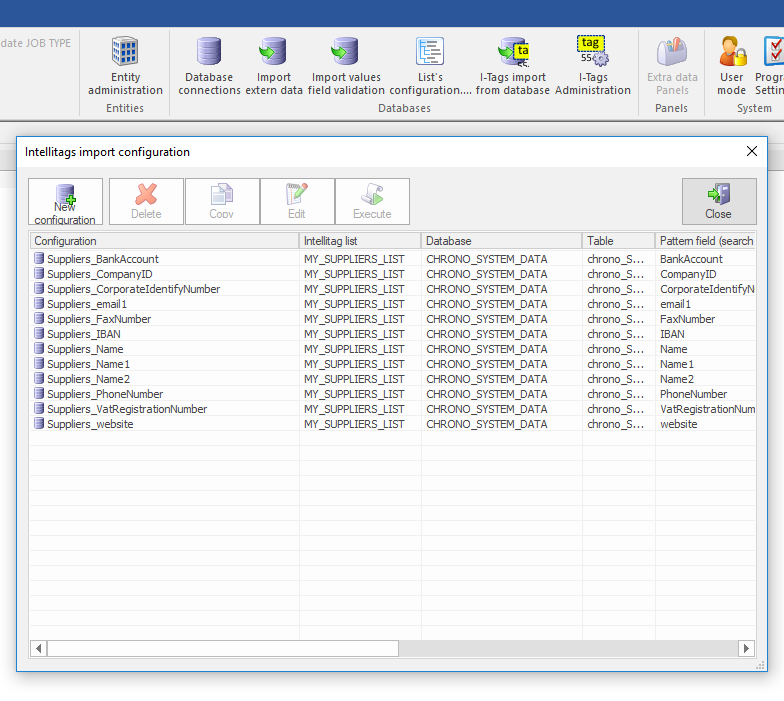 Just select one configuration at a time and then click on Execute Configuration. 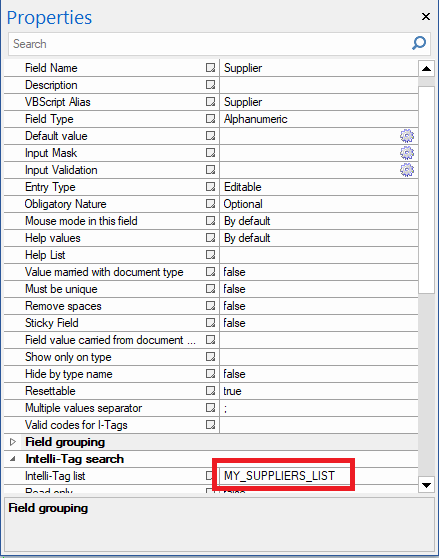 The default target list is MY_SUPPLIERS_LIST and the Value Field must always be Company ID. 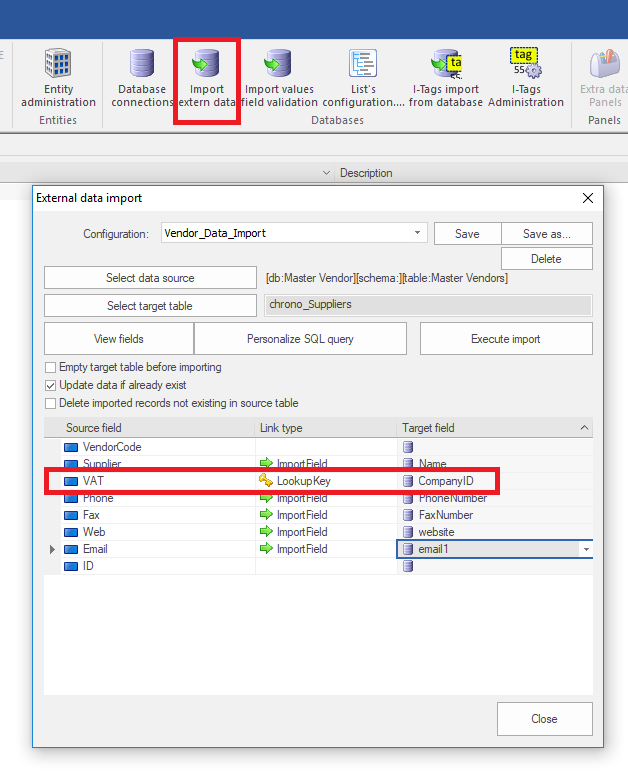 We recommend removing all configurations that are not needed and adding a scheduled task to automatically run both the data import and the intelli-tag conversion, specifically the -externaldataimport:"All" and the -intellitagimport:"All" parameters. Learn more about it here. At this point in the guide we have all the masterkeys already setup on the system. Now we are going to link the existing document types to those masterkeys. Link the new Supplier field to the MY_SUPPLIERS_LIST intelli-tag list. Now you can go ahead and process all documents. You should see the Supplier field filling in with the supplier ID for each supplier. 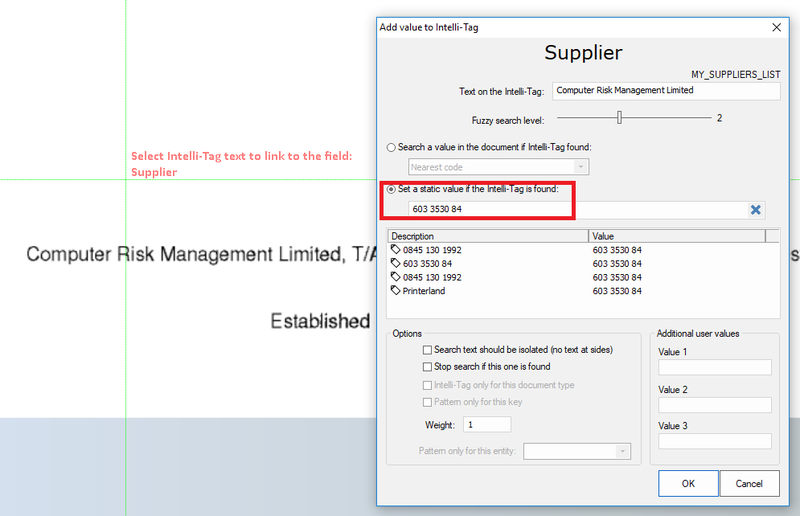 Whenever a supplier is not detected it means the intelli-tags were not found, so it is very important to go through those documents to create new intelli-tags to detect the supplier. The intelli-tags create should always be static value intelli-tags and the static value set should always match the selected masterkey field. 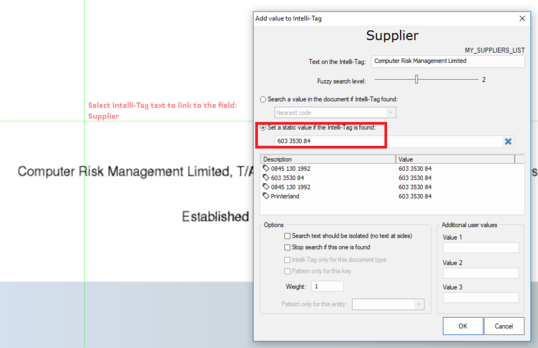 When creating the new intelli-tags, because we imported the Name1 field as intelli-tags, you can search by vendor name to find the vendor ID, then just select the name to set the vendor ID to the field. Once all document types have a vendor ID value on the Supplier field we can move to the next step. If you have created subtypes there is one additional step that must be done as masterkeys don't support subtypes. 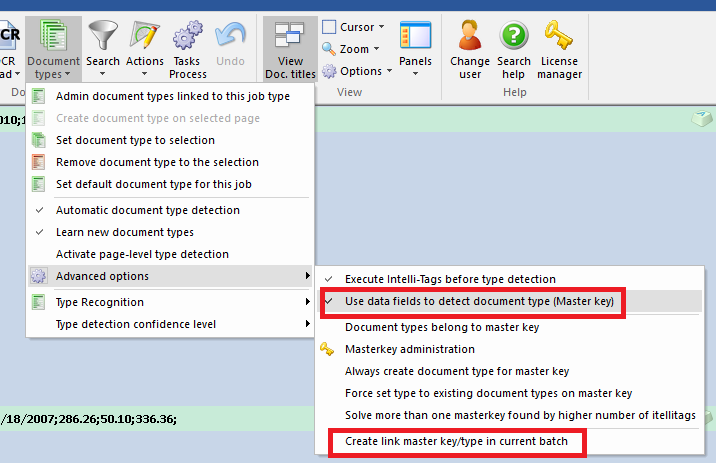 The subtype functionality is replaced by the possibility of liking several document types to the same masterkey. 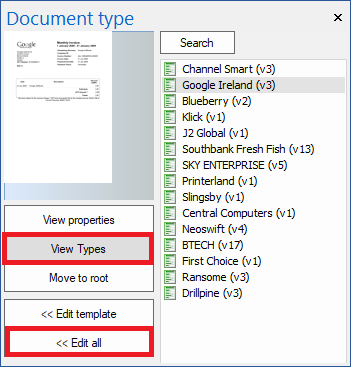 You must open the Document Type Panel and click on View Types. Subtypes will be nested below the parent type. 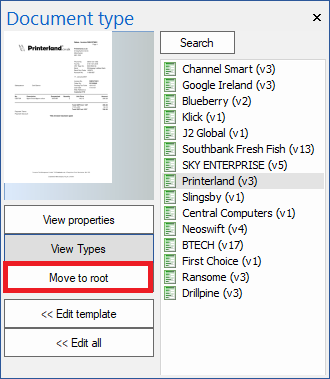 Just click on each nested subtype and then click on Move to Root. After that you can go ahead and enable all of the other advanced options. Close ChronoScan and open it again. When opening a new document you will see the Masterkey/Doctype Settings panel. There you can see your existing types linked to the masterkeys we just created. And that is it. As the master vendor database grows new vendors will be imported into ChronoScan which means new intelli-tags will be generated. 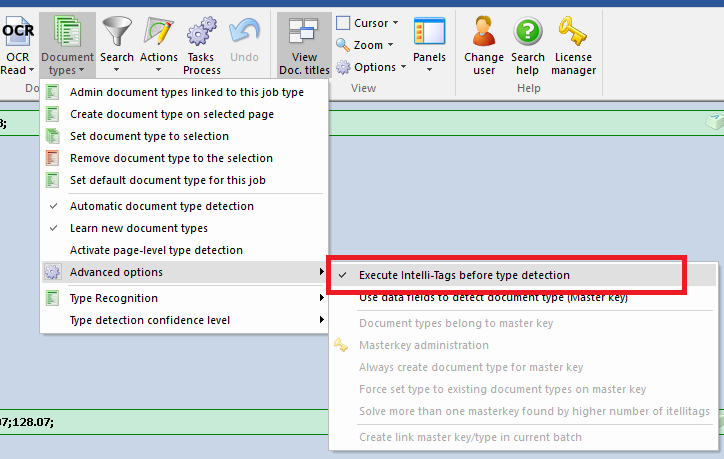 It might still require some manual intelli-tag creation as it is not always that the documents contain enough information to detect the masterkeys correctly, but you will still have access to all of the enhanced performance and functionality of a masterkey configuration.